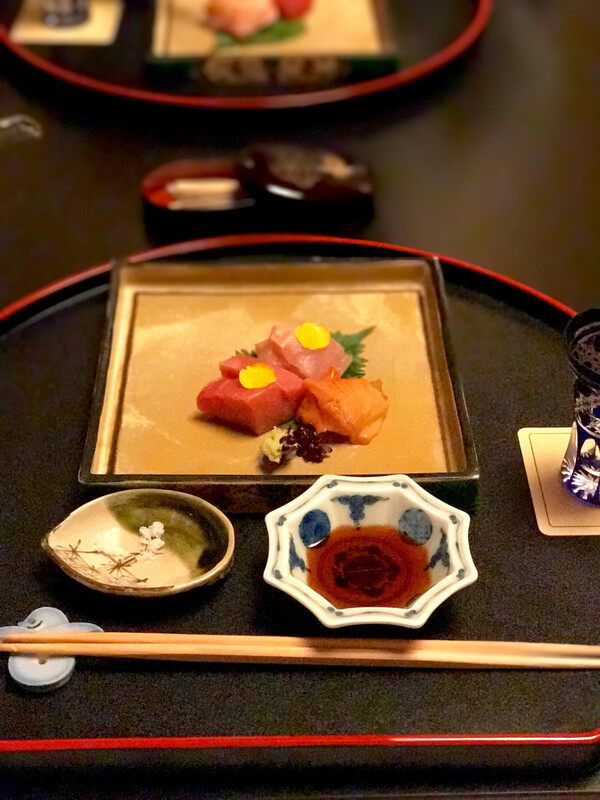 Ever since G and I watched Jiro Dreams of Sushi, we envisioned ourselves sitting at his bar, tucked inside a Tokyo subway station, eating the best sushi of our lives. We did end up having the best sushi of our lives, but it wasn&apos;t there (we didn&apos;t even attempt to get reservations which are almost impossible to secure). We ate exceptionally well in Japan, sampling some of the best ramen, dumplings, sashimi, pastries, gyoza, and pork tonkatsu we could find and devoured in an impressive amount of food in ten days. Here&apos;s a look at everything I ate! Note: I followed in Leslie&apos;s footsteps and rated everything using a four-star scale, New York Times-style: "One star, good. Two stars, very good. Three stars, excellent. Four stars, extraordinary." If it has no star, it doesn&apos;t necessarily mean I didn&apos;t enjoy it, it just means it didn&apos;t stand out. So if you&apos;re overwhelmed by the number of places on this list, feel free to scroll until you see a star! Dinner: We arrived at our hotel in the early evening after a very long day of traveling and were famished by the time we dropped off our bags. Our hotel was connected to a mall, so we sleep-walked across the way, hoping to find a semi-decent place to eat. We settled on a spot that was overpriced and forgettable, but we were able to get seats at the bar so we were pumped. We ordered a flight of yakitori, even though we weren&apos;t exactly sure what was being served on each skewer. On that note, I never had chicken gizzard before and don&apos;t recommend it. We were also instructed to order what was essentially potato wedges in addition to some mediocre sashimi. Needless to say, it was not the most impressive culinary experience to kick off the trip. Snack: Japan is sixteen hours ahead of Los Angeles, so the first night, after falling asleep at 7pm, we woke up, ready to start the day at 1am. It was rough. We hung out for a while, listened to podcasts, and I ate two bags of Cheez-Its that I squirreled away in my carry-on. Breakfast: Grand Hyatt Hotel - The lounge in our hotel opened at 7am and we basically hovered in front of the door waiting like a pair of zombies. Of course I didn&apos;t pace myself in the slightest and opted for scrambled eggs, sausage (which more closely resembled American hot dogs), a surprisingly good strawberry pastry, and a fruit plate of papaya and melon. 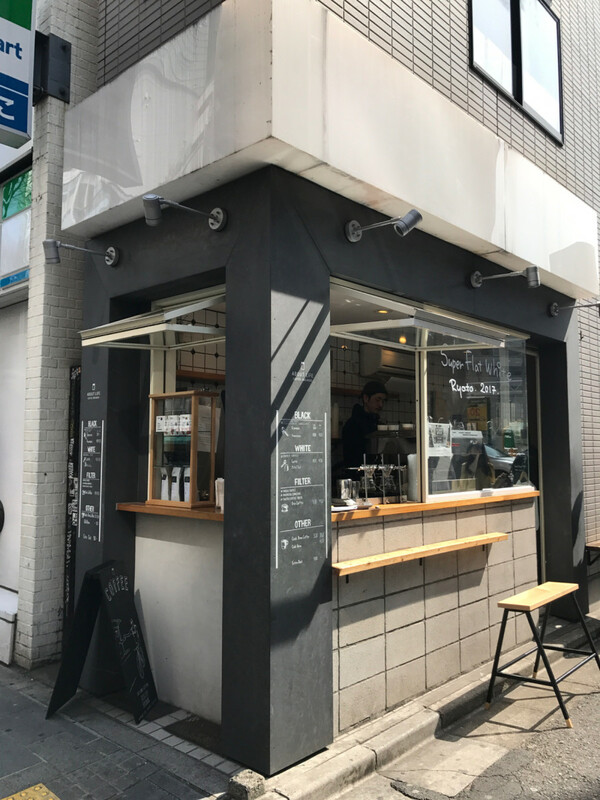 **Coffee: About Life - Third wave coffee culture is catching on in Tokyo, so we made it our mission to track down great drip coffee and espresso drinks. We walked to About Life, a teeny corner spot known for their Flat Whites, which is what I ordered. It was a cold, but sunny morning and the few minutes we spent sitting on a stool drinking our coffees was a great way to start our first day in the city. *Lunch: Hayashi Ramen - G and I had read a ton of great reviews about Hayashi and knew we&apos;d found the right place (it was a little tough not being able to read the signs) when we turned the corner and saw a long line of people waiting outside the little shop. 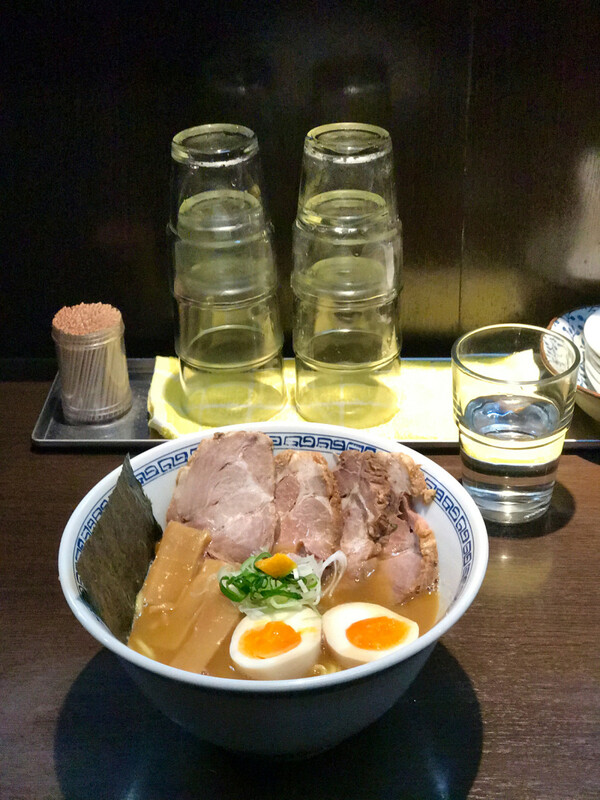 You purchase your ramen via a vending machine that provides three options, 1) with egg 2) with pork 3) with both. After you pay and get your ticket, you wait until a seat at the counter opens up, hand over your ticket, and wait for your food to be served. Though every seat was occupied, its patrons were silent, aside from the ritualistic slurping. The soup was good, but not what I was expecting, as the broth was pork and seafood-based. We still managed to finish the massive bowls, though neither of us fully embraced the slurping culture. *Snack: Zaku Zaku - After walking around for a few more hours, I was craving something sweet. Harajuku was packed with a large variety of cute treats and I settled on a soft serve that had been dipped in some sort of crumbled cookie. The vanilla flavor of the ice cream was good, though the texture was much firmer than I&apos;m accustomed to, but it served as a nice mid-day snack. Dinner: Grand Hyatt Hotel - By the time dinner rolled around, I could barely keep my eyes open, so G agreed to ordering room service. We got the tempura (always a bad call if you&apos;re not going to eat it immediately), some sushi, and chicken teriyaki. Everything was so mediocre that I apologized for having been so lazy in our attempts to find a good spot within walking distance from our hotel. **Snack: Andersen - The day before, G and I had picked up a variety of baked goods from Andersen, a bakery located in Tokyu Food Show. For the second night in a row, we woke up in the middle of the night, completely famished, so I was happy that we had a rolled pastry that was filled with a chocolate pudding and dipped in sprinkles. It made the fact that we were so sleep deprived seem not as bad. Breakfast: Grand Hyatt Hotel - Once again we were sleep walking when the lounge opened at 7am. I remember doing continuous laps around the food station since I could barely think straight. When I put some bread into the toaster that wouldn&apos;t brown properly, I almost started to cry. Needless to say, it was a rather rushed breakfast—I think I had a bowl of fruit and some hash browns—before heading back to our room to take a nap. 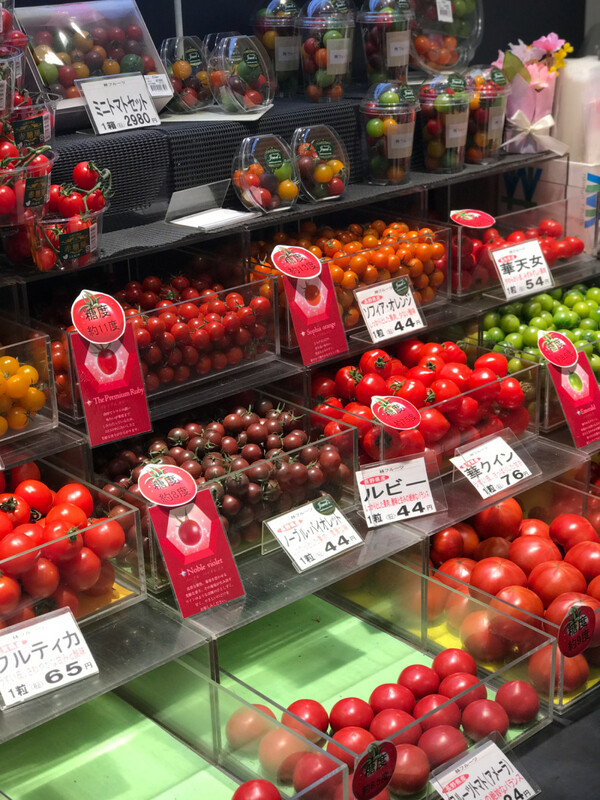 Snack: Zenshutoku - Everyone told us to check out the food halls that are located in the basements of most department stores. I&apos;d been skeptical, but they were beyond impressive. For a mid-morning snack, we settled on some gyoza, which we hurriedly ate outside. We hadn&apos;t realized it wasn&apos;t going to be warm, so the fact that it was cold and slightly hard wasn&apos;t ideal. 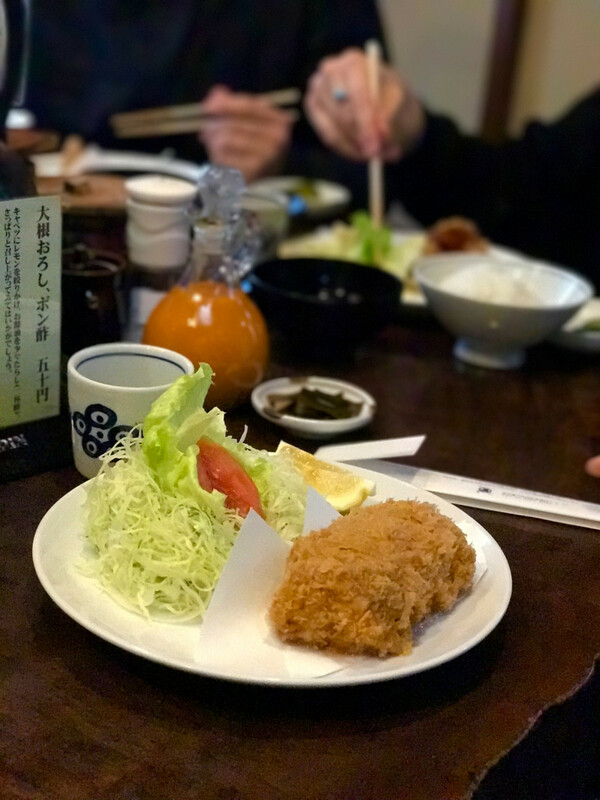 ***Lunch: Marugo - I had never had pork tonkatsu before, deep-fried pork cutlets typically served alongside cabbage and rice, but knew it was something I needed to experience. We stood in line in the rain for about 45 minutes and it was well worth it. We were shuttled inside, up a narrow staircase, and seated at a table with six other guests, all of whom had ordered the same thing. We got their pork tonkatsu plate and watched to see how everyone else added the multiple sauces to their plates. The meal was so incredible that I was bummed when I was too full to finish the last few bites of rice. *Coffee: Omni Bus Coffee - We needed an afternoon pick-me-up and after walking through the blustery wind and rain, stumbled across this tiny coffee hut. I got a latte to-go, which helped me avoid frostbite (it was about 20° F with wind chill, which I did not plan for) while also giving me a jolt of energy. Snack: Potager Patisserie - About an hour later, G and I both needed to use the restroom so we decided to get dessert at a bakery so that we could use their facilities. I ordered what I thought was a slice of chocolate cake (FYI though Japan has so many intense, umami-enhanced flavors, we were surprised to find that their chocolate almost always fell flat. It just wasn&apos;t chocolately enough for us.). What we&apos;d failed to realize was that we&apos;d gone to a vegetable bakery—as in, a place that incorporates things like tomatoes and leeks into their cakes. It was comically bad, to the point where we both panicked as to how we&apos;d dispose of the food without offending anyone. 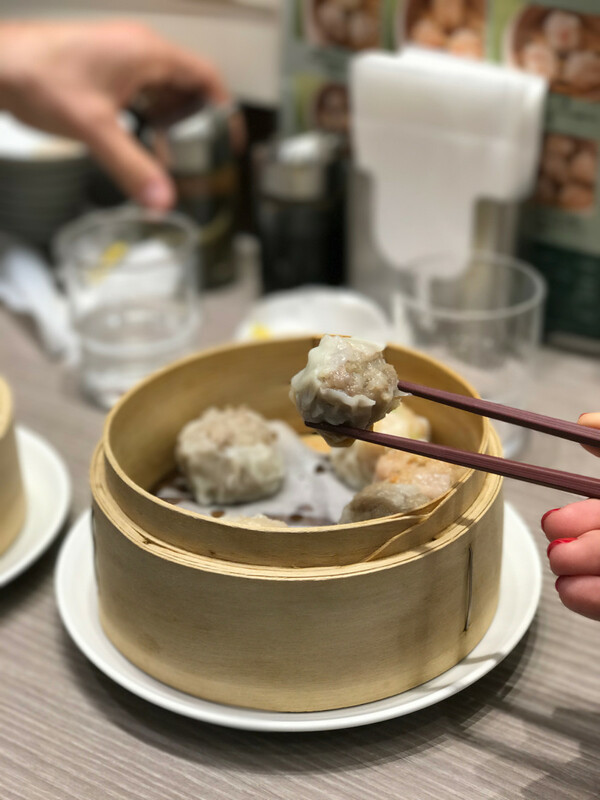 **Dinner: Tokyu Food Show - We&apos;d heard good things about a restaurant near Shibuya Station that served fantastic sushi, so we headed in that direction. We&apos;d forgotten our WiFi hot spot, which made us feel a bit lost and quite dependent, but managed to find the location, along with a sizeable crowd that was hovering near the entrance. We&apos;d heard the spot was really popular, so I momentarily questioned whether the wait would be as long as we&apos;d heard (upwards of 90 minutes). I asked another person if they had put their name on the list yet, at which point he informed me that they&apos;d been there already for 2 1/2 hours. We promptly swung by Tokyu Food Show to pick up some dumplings, sushi, and Pocky and took it back to eat in our room. Breakfast: Grand Hyatt Hotel - By our third day, I started to pull back on breakfast a bit since the rest of our days were feeling heavy. I opted for a bowl of fruit, some cottage cheese, which more closely resembled crumbled farmer cheese (mild in flavor and left out on the counter), and a small bowl of cereal. Snack: We did a lot of bouncing around on Monday and found ourselves in Tokyo Station just before lunch. Since we had an appointment at 12pm (at the David Bowie exhibit), we decided to duck into a little restaurant for Shui Mei. We sat at a cramped bar and were served immediately some of the most impressive dumplings I&apos;ve ever had. Unfortunately I was so focused on making sure we swung by a nearby candy store that I forgot to take down the name of the spot. 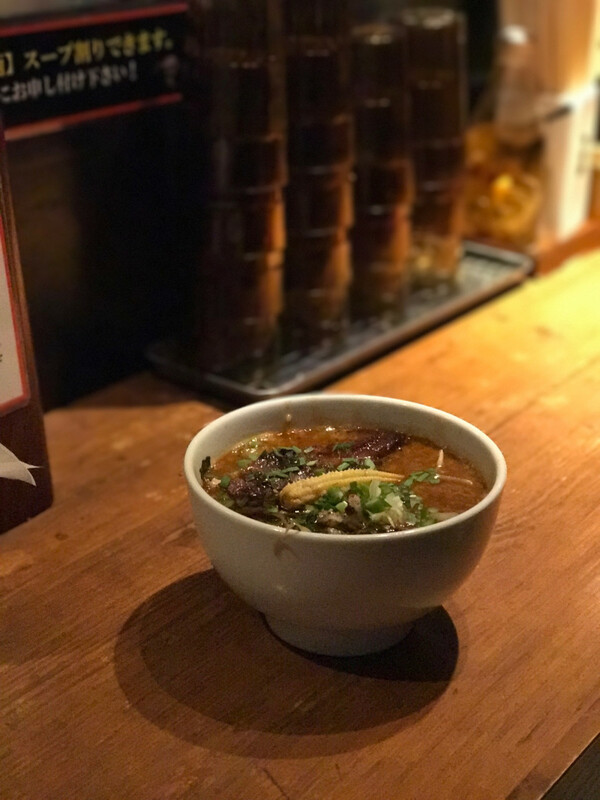 *Lunch: Kikanbo - We grabbed a late lunch at a David Chang-recommended spicy ramen spot that&apos;s known for their miso-based soup. The decor was cool, with devil masks hung along the black walls and intense drum rhythms playing the entire time. By our second time ordering ramen from a vending machine, the process seemed much less intimidating and a lot more fun. G ordered his soup much spicier than I opted for, but mine still had a good kick to it. 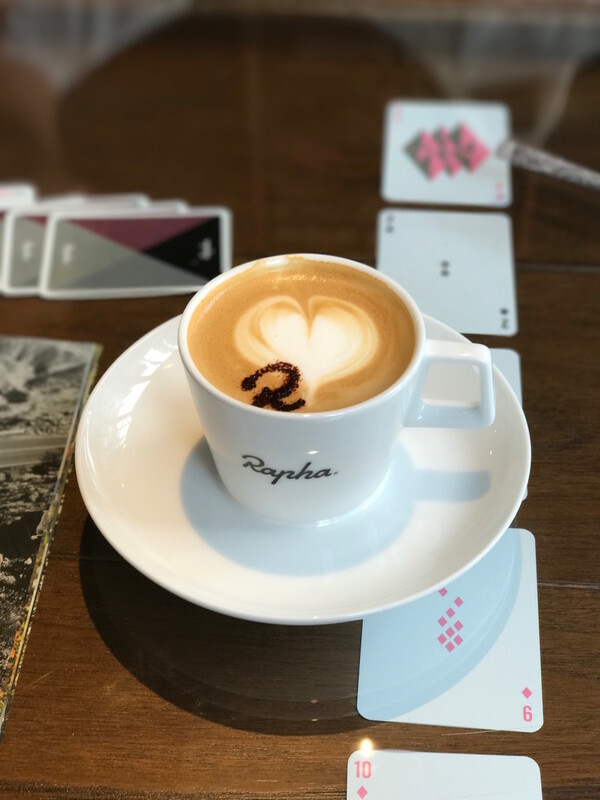 *Coffee: Rapha Store - G wanted to visit the Rapha store, his favorite cycling brand, that also happened to have a café upstairs. The area around the shop was really cute and I ordered a fantastic flat white, which I enjoyed while G looked around. 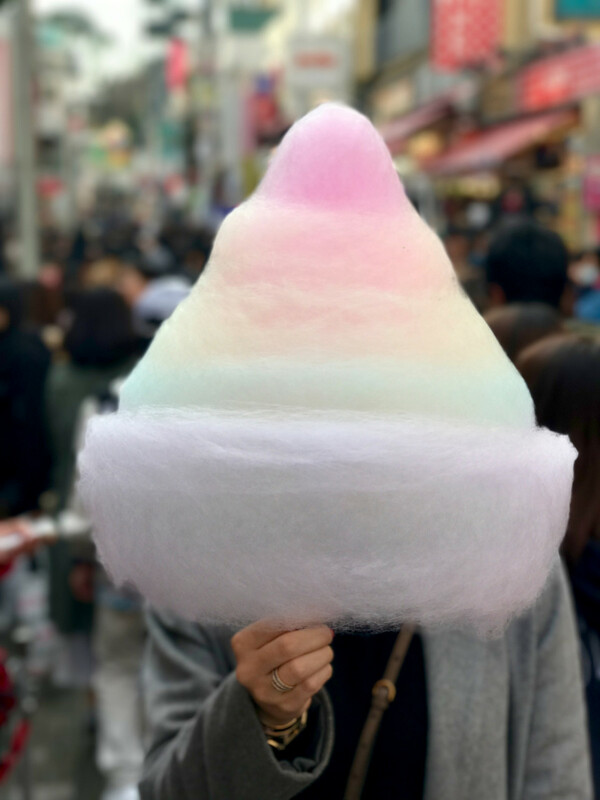 **Dessert: Totti Candy Factory - A couple of years ago, I took a screenshot of someone&apos;s rainbow-colored cotton candy they&apos;d posted on Instagram while on vacation in Tokyo. I never forgot about it and when I realized that we were a quick 10-minute walk from the Rapha store, I practically skipped the entire way to the Harajuku location. G had to duck his head in order to fit inside the brightly lit candy store, which sold a few varieties of colorful, flavored cotton candy near the cash register. Naturally I got the rainbow, and promptly ate it outside, where I managed to get my beanie and coat covered in a sticky layer of neon sugar. You could actually taste the different flavors of each color, which I found impressive, though I would have been satisfied simply to hold such a pretty, cloud-like masterpiece, regardless of how it tasted. 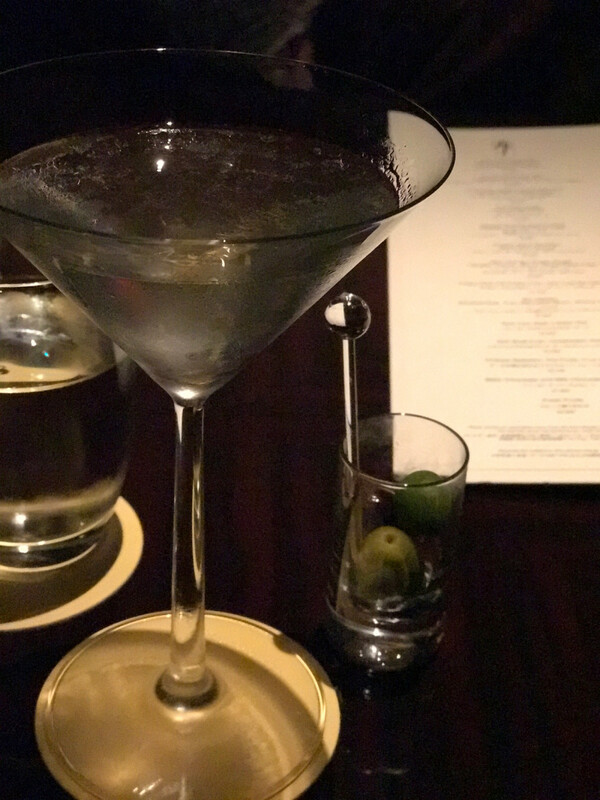 Dinner: Grand Hyatt Hotel - It took us several days to realize our hotel also offered a complimentary happy hour service each evening, which was perfect since we were usually too full and tired to make the trek out to dinner. I drank Champagne and happily ate cheese, crackers, and chips for dinner. Breakfast: Grand Hyatt Hotel - Same old cereal and fruit plate. Lunch: We&apos;d heard amazing things about the Daikanyama neighborhood from multiple friends, so we decided to take a train over there after walking to see cherry blossoms in the morning. We arrived at around lunch time though, and had done zero planning in terms of researching spots to eat, so we settled on a place that was packed, but had zero English on the menu (nor a helpful vending machine). Since they had plates of food on display outside, G and I literally walked back out with our sweet waitress and pointed to what we wanted. We both got the tempura and soba noodles, which were simple, but great. 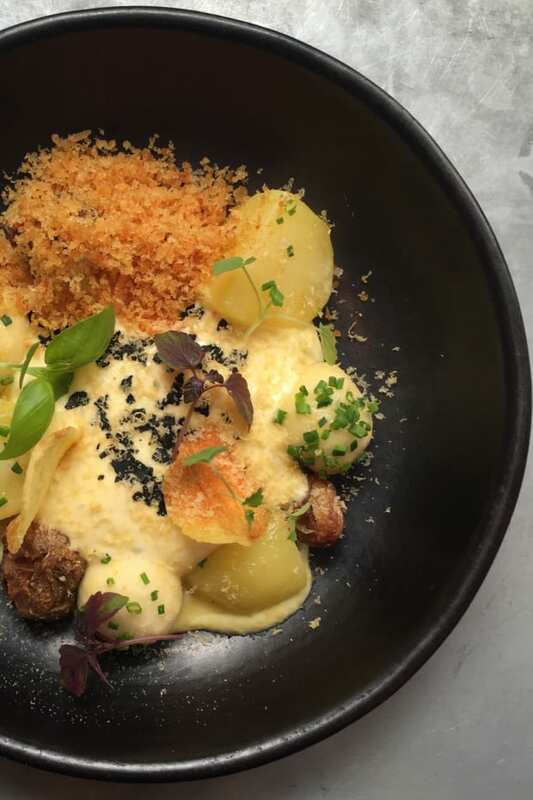 Even though we weren&apos;t entirely sure how to eat the meal—there was a random bowl of sauce with some accoutrements that we were either supposed to be mixed all together or used as a dipping element—we just kind of improvised. I didn&apos;t get the name of the restaurant and while it was definitely enjoyable, it&apos;s not a place I&apos;d recommend as a must-visit. 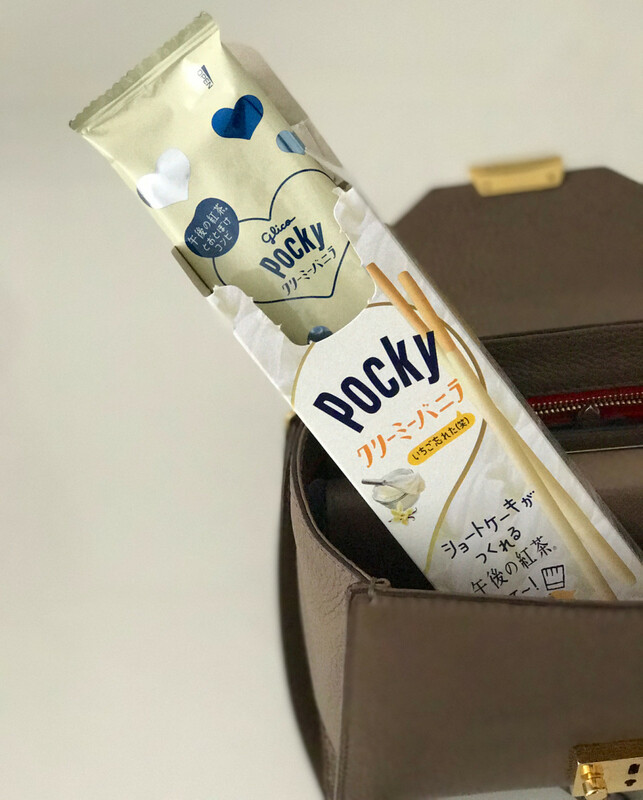 Snack: As a self proclaimed Pocky enthusiast, I was ecstatic about the idea of discovering new flavors once we arrived in Japan. 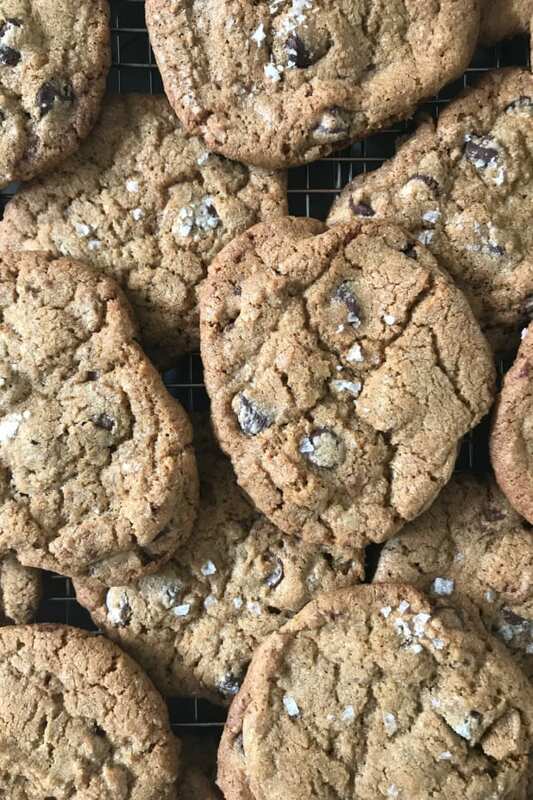 Most of the ones I tried were too over-the-top or unique, but the vanilla flavor (or perhaps it&apos;s cake batter?) quickly became my new favorite. I consumed the entire box on the way to the train station to get back to our hotel. I&apos;d bought them in a Natural Lawson convenience store and had tried to convince G that I had to purchase their entire stock, but he assured me I&apos;d be able to get it anywhere. Turns out, it&apos;s not as widely available as we&apos;d thought, which caused me to majorly panic that I&apos;d found the one box in the city. Thankfully, once we got to Kyoto I was able to hoard a sizable collection to bring home. **Dinner: New York Bar, Park Hyatt Hotel - For our last night in Tokyo before going to Kyoto, we decided to go to the Park Hyatt Hotel for drinks and dinner. It&apos;s the hotel (and bar) where Bill Murray and Scarlett Johansson stay in &apos;Lost in Translation&apos; and has insane views of the entire city. I&apos;d had a somewhat good understanding of just how massive Tokyo was from simply walking around for several days, but once we were 52 floors up, it offered even more perspective. I ordered a dirty martini, which was ice-cold and mixed to perfection, along with a cheese plate, shrimp popcorn, olives, and a spicy nut mix. The experience was fun and touristy, though I was relieved once we eventually left the overly smokey room. 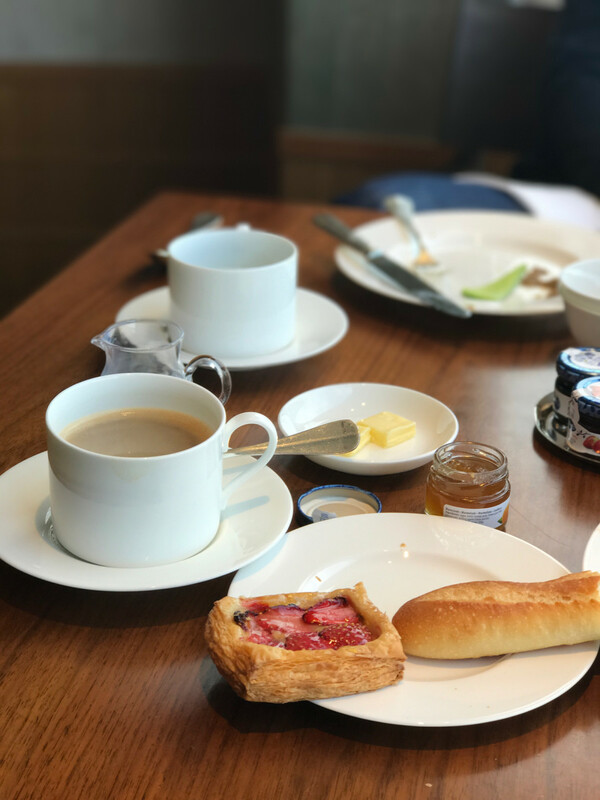 Breakfast: Grand Hyatt Hotel - I&apos;d gotten a bit bored of the breakfast selection the last few days, but since it was our last morning in Tokyo, all of a sudden I was sad to leave something that felt so familiar. 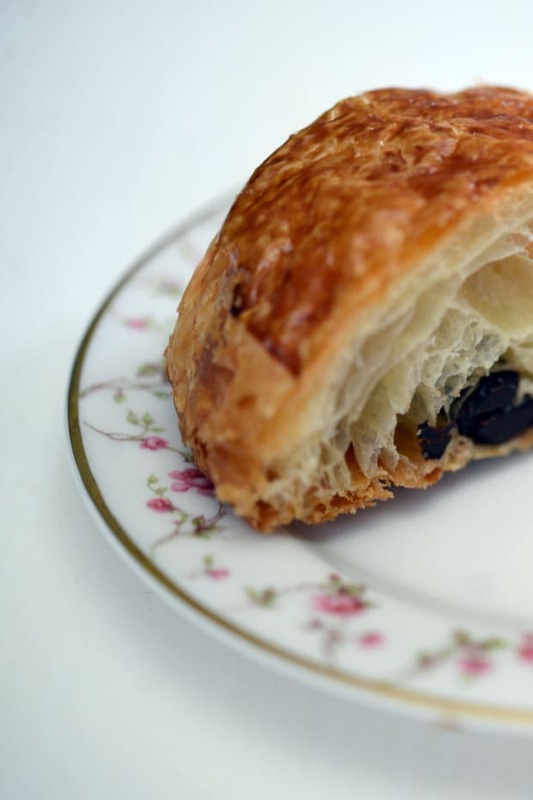 I decided to switch things up and try their pain au chocolate, which was actually incredible. Up until this point, we hadn&apos;t gotten one semi-decent chocolate dessert, so it was a nice surprise. Lunch: Bullet Train - G and I got to Tokyo Station hoping we&apos;d have enough time to grab a quick lunch before heading to Kyoto, but ended up barely getting to the platform just before our train arrived. 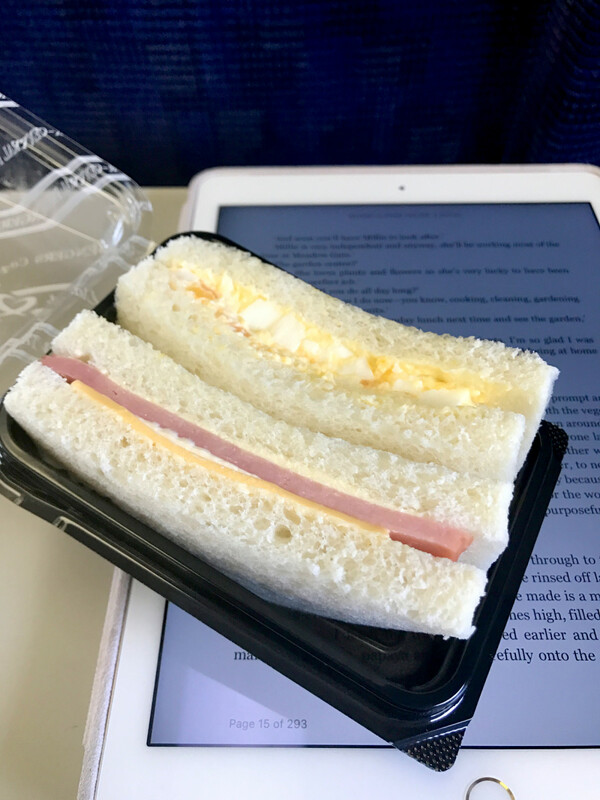 Luckily, they had a little food cart on the train where I got a sandwich—one half was egg salad and the other was bologna and cheese. It appealed to my inner pre-schooler: the bread was white and fluffy (with the crusts neatly cut off) and the insides were flavorful, but simple. Snack: After we got to Kyoto, we set out to explore the city. Since we were scheduled to have dinner at our Ryokan at 7 p.m., we got snacks in the afternoon to hold us over. There weren&apos;t many restaurants open at that time, so we hit up the first 7-11 we saw. We&apos;d heard from multiple people that convenience stores actually have great food (for the record I would never eat at one in the U.S.), so we decided to try it out. I got a rice ball filled with tuna and mayonnaise that also came with a piece of seaweed (to wrap around the outside right before eating it so it wouldn&apos;t get mushy). It was about $2 and was comparable to some of the best hand rolls I get in L.A. It was insane. G got a pork tonkatsu sandwich, which I tried and liked, though the sauce was a bit sweet for my taste. Dinner: Yoshikawa Inn - G and I got back to our Ryokan in time to take a quick soak in our cedar tub and change into our yukatas before dinner. Since we had a little area that was like a dining room in our suite, we sat there waiting for our food to arrive. But after a few minutes of awkwardly hanging out, one of the women who worked at the inn came and took us to another private room a few doors down. We&apos;d ordered the kaiseki, which is a traditional multi-course Japanese meal. I was a bit intimidated since I didn&apos;t know just how weird-to-me the food would get, which only intensified after the first course. It was "fresh sea urchin and soy milk tofu with wasabi jelly sauce." The textures were a bit goopy and briny, but not in a way that was offensive or off-putting. The rest of the meal was a lot more predictable, with a soup, sashimi, some tempura, and a grilled fish, all of which was fresh, bright, and truly enjoyable. We&apos;d shared a bottle of sake and then took comfort in knowing that our beds were only a few feet away. Breakfast: Yoshikawa Inn - Our stay at the Ryokan also included breakfast, either Japanese or Western, so we both chose the former for our first morning. 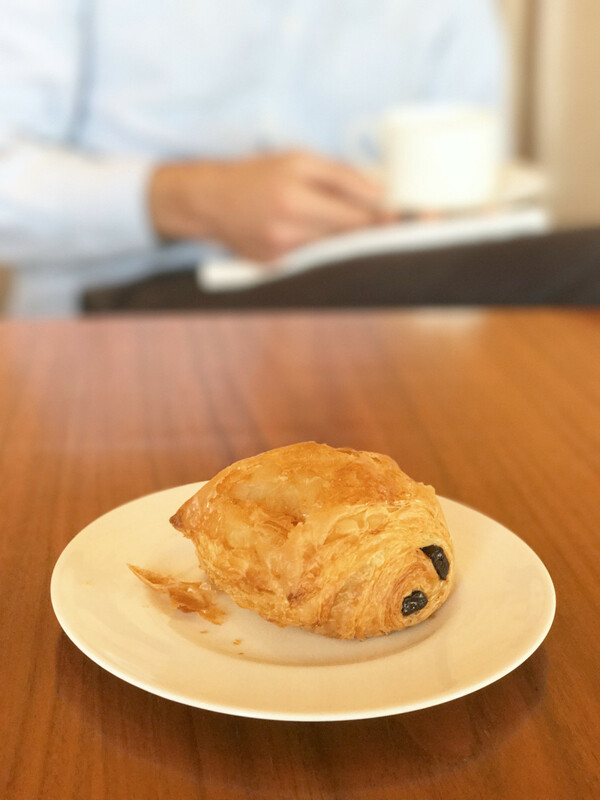 As soon as I woke up, I realized I&apos;d made a mistake since all I wanted to eat was something familiar and comforting, to go alongside a cup of coffee. But it turned out to be great and the meal was full of delightful little surprises: a tiny plate of pickles, fresh tofu served with sliced green onions, some fish and rice. Beyond the fact that the experience of eating everything was lovely, I also felt satiated in a way that didn&apos;t also weigh me down. But since our meal only came with green tea, we left in search of coffee. ****Coffee: Arabica Coffee - Let me just preface by saying that our entire experience at Arabica Coffee was incredible, which began even before we arrived. The shop is situated on a hill that leads up to Yasaka Pagoda, the last remnant of Hokanji Temple, that&apos;s over 500 years old. You feel like you&apos;ve stepped back in time, making the gorgeously minimalist and sleek interior of Arabica feel that much more special. 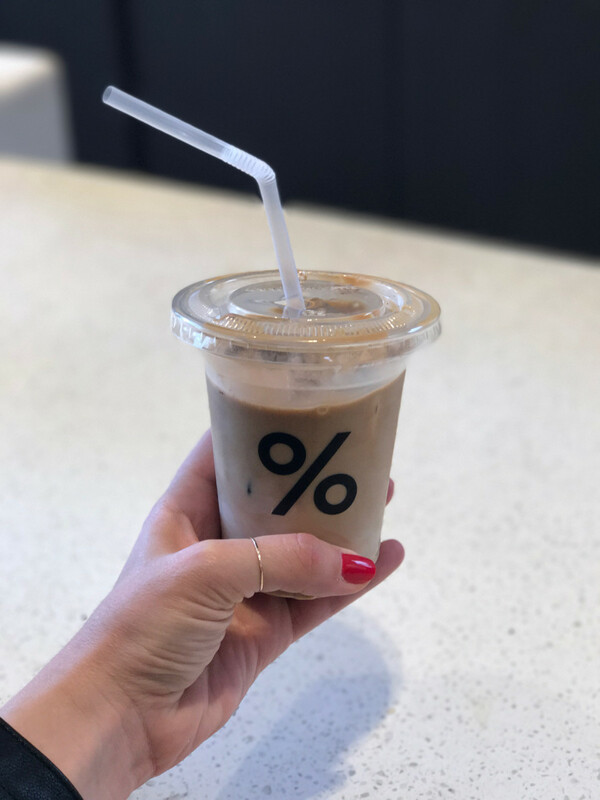 I ordered an iced latte, which came in a plastic cup with a straw that was too big, though to my surprise, was the best iced latte I&apos;d ever had. ***Dessert: Kiosk near Kinkaku-Ji - We had a bunch of gyoza recommendations that we wanted to try out for lunch until we realized that none of them were open during the day. Since we were on a mission to see as much of Kyoto as possible, we opted to skip lunch and just munch on snacks as we traveled around. 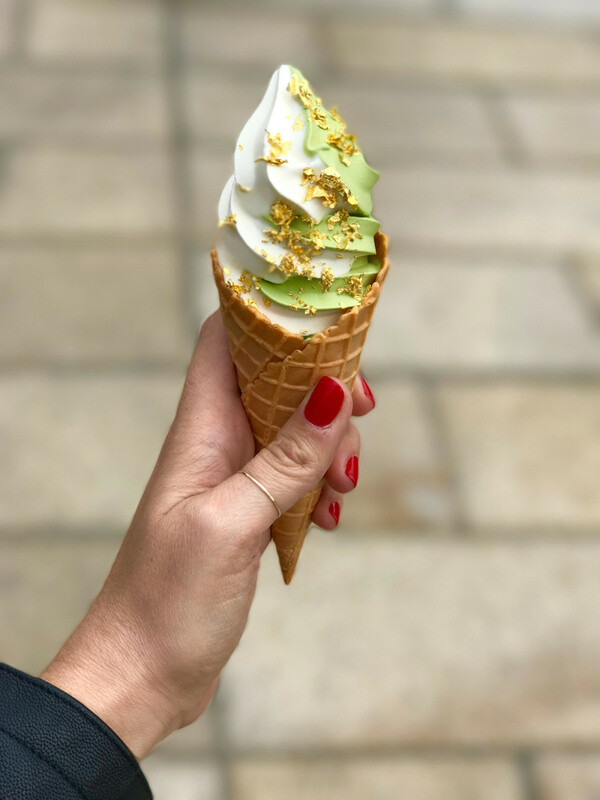 Outside of Kinkaku-Ji, we took a break and I got one of the vanilla/green tea swirled soft serves that came with gold flakes (as an ode to the nearby golden temple). It was too cute not to get, but also a pretty fantastic combination—the vanilla was rich and creamy, and the green tea flavor served a refreshing complement. Snack: I&apos;m not someone that really ever misses a meal, so while I thought a soft serve and snacks could replace lunch, I found out that I was very wrong at around 4 p.m. We still had three hours until dinner at the Ryokan and I was hangry beyond belief. G offered to run out and pick up some snacks and came back with enough food to feed a small army (we&apos;re notoriously bad at over ordering/buying when we&apos;re starving). It was a nice way to sample a plethora of snacks though, from wasabi peas and buttery crackers, to sushi rolls and biscuit cookies. By the time we ransacked the snack supply, I felt like I&apos;d be fine never eating again. Dinner: Yoshikawa Inn - G and I opted for the Shabu-shabu dinner for our second night. I&apos;m not a huge meat fan (I prefer straight-up carbs), though I was intrigued by the idea of having the traditional meal while in Japan. They laid out a beautiful assortment of things to cook over the boiling pot of water that sat between us: thinly sliced wagyu beef, rice cakes, tofu, clear noodles, and a variety of vegetables. They showed us how long each item should be placed in the water until it was cooked. The beef went in for seven seconds, at which point we were supposed to drag it back and forth through the water while singing, "Shabuuuuu-shaaaaaabu" in a slightly creepy, sing-songy voice. Everything was fantastic and I loved the casual vibe of our dinner together. Breakfast: Yoshikawa Inn - After getting the Japanese breakfast the day before, I requested the Western option for our second morning. It included scrambled eggs, sausage (again that more closely resembled hot dog), rye bread that I toasted at the table, an orange that had been hollowed out and replaced with the supremed fruit, yogurt, and a pot of coffee. At this point in the trip I&apos;d begun to feel pretty homesick, so it was nice to eat a straightforward meal that felt familiar. Snack: Similar to our train trip into Kyoto, we decided to skip lunch at the station so that we could grab sandwiches once we were seated (and listening to S-Town). Unfortunately we were in the back of the car and by the time the food cart made its way to us, the only remaining options were potato chips and a Japanese snack mix, which we scarfed down. Needless to say, once we arrived back in Tokyo, we were beyond excited to go to our one reservation of the entire trip. ****Dinner: Sushi Bar Yasuda - I first heard about Naomichi Yasuda because of his legendary restaurant, Sushi Yasuda, in New York (that was consistently hailed as one of the best spots in the city, garnering three stars from &apos;The New York Times&apos;). In 2011 he opened his Tokyo outpost and I was beyond impressed with G when he was able to snag us a reservation at the sushi bar. Up until this meal, the sushi we&apos;d had in Japan was great, but nothing life-changing... until we went here. 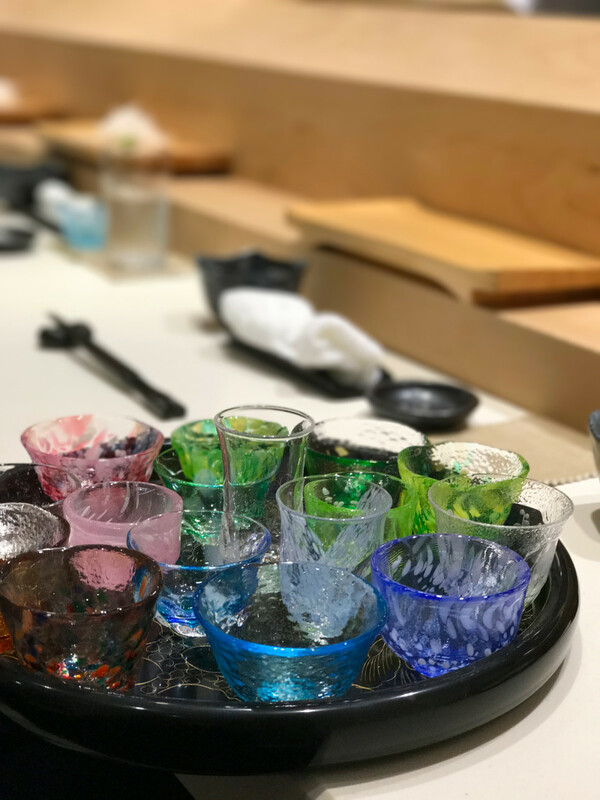 The whole experience was exhilarating, from choosing our own handblown sake glasses to the texture and flavor of each and every piece of fish. There was no soy sauce or wasabi in sight and every single thing we ate was divine. Neither G nor I typically eat or like uni, but when we were gently encouraged to try it, we were both blown away. Not only did we both manage to tolerate it, we were suddenly converts and G even requested an uni hand roll to end the meal. Perhaps the only thing that eclipsed the actual food was how much fun we had with Chef Yasuda. He was hilarious and personable and shared interesting tid-bits about sushi culture and life in Tokyo. 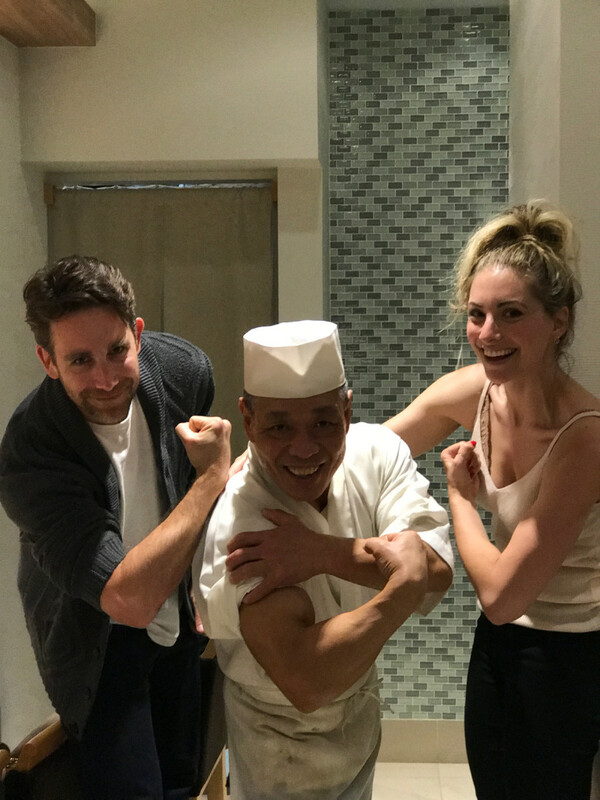 At the end of the meal, he came around the bar to say goodbye, so we took the opportunity to snap a picture together (he insisted on showing his impressive biceps). 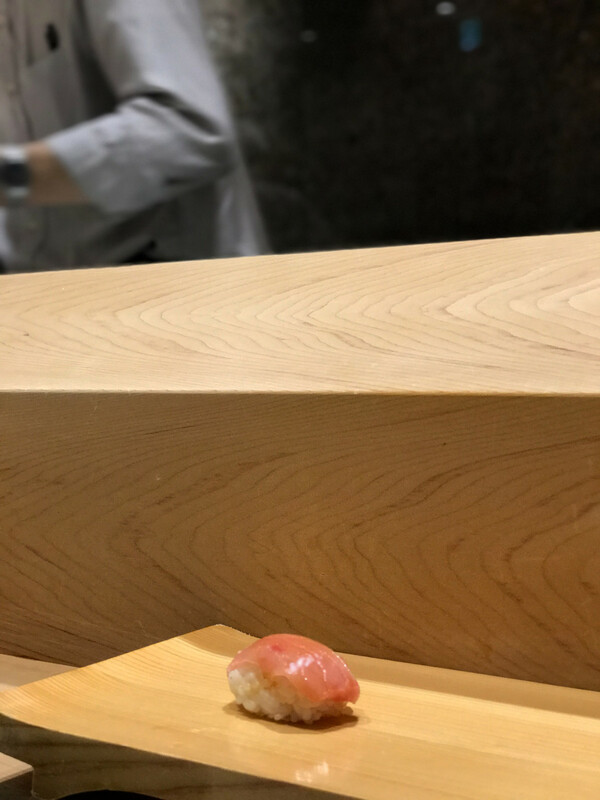 Our meal at Sushi Bar Yasuda was so special that I found myself almost emotional as we climbed back up the steps onto the rainy streets of Tokyo. 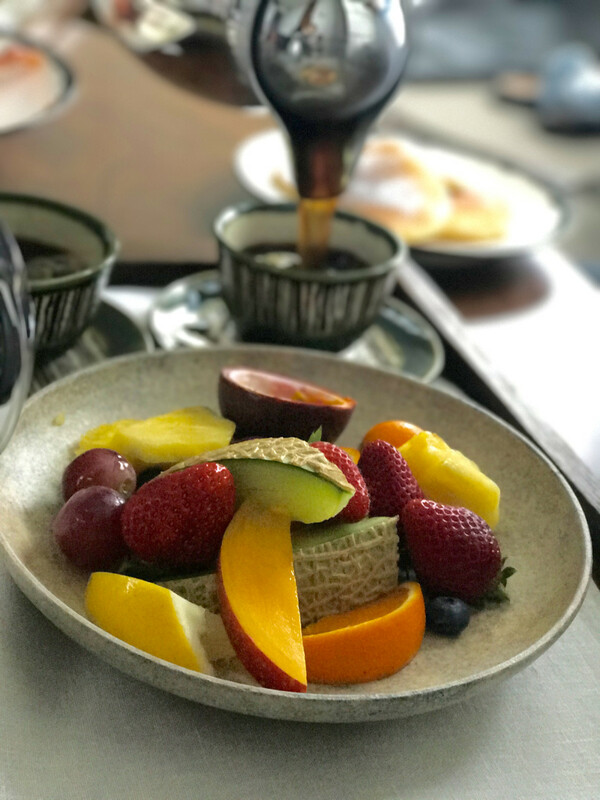 Breakfast: Andaz Tokyo - For our last official meal in Japan, I ordered a fruit plate (I also discovered, over the course of the trip, that I love passion fruit), eggs, toast, and coffee. It helped hold me over until we got onto the plane later that afternoon, at which point I tore through a good portion of our candy stash we&apos;d bought on the trip. 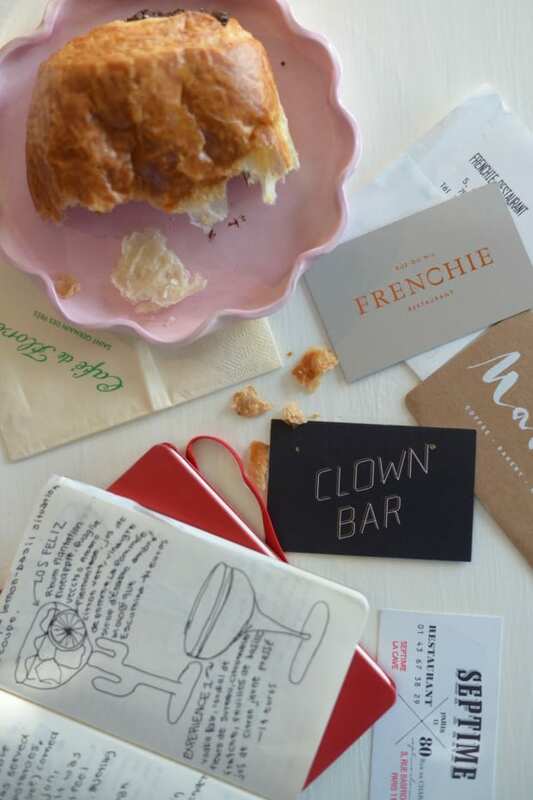 P.S., Here&apos;s a look at what I normally eat during the week and my Paris Food Diary.